I thought for this week’s Blogger Tip Tuesday, I’d talk about a topic that is probably relevant for all of us: avoiding blogging burnout. Sometimes you can feel like you are just tired of blogging and need a break. We’ve probably all been there and it’s not fun. So this week’s I’m sharing tips on avoiding blogging burnout. I love blogging and luckily, I very rarely feel burnt out from blogging. 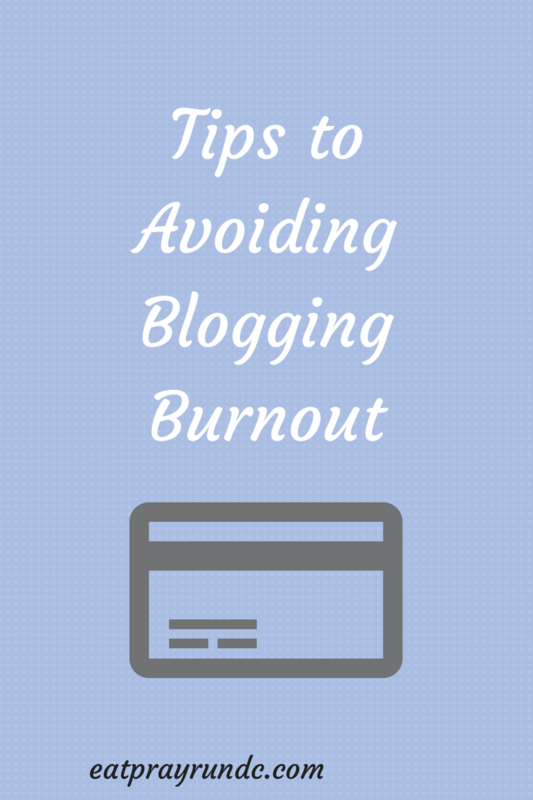 Hopefully these tips will help you in avoiding blogging burnout. Try saying that three times fast – it’s a mouthful! Get organized. Getting yourself into a blogging rhythm and figuring out some semblance of a schedule that works for you can be very helpful in avoiding burnout. Personally, I like to spend a bit of time on my blog each day, but I plan ahead so that if that’s not possible, I’m not feeling pressured or scrambling around to post. I use CoSchedule to plan my posts out and schedule them to go out on social media, which helps tremendously. Generally, I have a rough idea of what I’m going to post each day and when I can, I write posts in advance. That doesn’t always happen, but keeping a list of ideas is also very helpful. I keep a list of ideas on my desk and also on my phone. Get balance. You should never feel like you have to post or have to do anything in regards for blogging. I hate seeing people apologizing for “being a bad blogger” – in my mind, a bad blogger is one who just spits out junk because they feel like they have to. If you normally post 3 days a week and you miss a day, that’s okay. If you normally post 5 days a week and you miss a day, that’s okay. Really. It’s okay! About a month or so ago, I was just drowning in work and life and didn’t have a post lined up for one day. So…I just didn’t post. I scheduled some old posts to go out on social media and moved on with my life and my day. And the world didn’t stop turning – everything was fine. You have a life outside of the computer – don’t ignore it! Get happy. Blogging should be fun. If you aren’t having fun, figure out why and what you can do to change that. I love writing and I love reading and I love running. Blogging allows me to combine my interests and I love that. If I felt like blogging wasn’t fun, I’d stop. Period. Get real. People gravitate towards honesty. If you are struggling with something blogging related, maybe that means you should blog about it. Chances are others are struggling with it as well. Generally, when I learn something new (blogging related) or find a great new recipe, it ends up on the blog. This post was inspired because I thought about how much I enjoy blogging and don’t suffer from burnout, but I know others that do. Being honest when you are struggling can make a frustrating situation suddenly refreshing because you are sharing it with others. How do you go about avoiding blogging burnout? Fabulous post! I think when I started blogging I was a bit overwhelmed – how do I balance it all? Now I am loving it (gradually gone from 3x to 5x) and keeping organized helped (my draft list of ideas has increased by jotting things down throughout the day). staying organized is a huge help! Great tips! You are so right that its ok to skip a day. I think its good sometimes to take a break! And honesty is definitely important. Even though we are behind a computer I think the readers can still tell who is being genuine. Great post! I feel like I am in a good schedule now. I need to get coschedule. I’ve seen you reference it a lot. Hope I can figure it out. On the to do list for this week. i really do love coschedule. it keeps me organized! I often feel guilty if I don’t have the time or energy to write the next day’s blog post, even though I know that I shouldn’t. If I need to skip a day, I know that my readers will understand. Yes, I love how you say don’t ignore your life outside of blogging! When people apologize for not blogging I always say ” that just means you are out living your life and that is SO much better than blogging”. balance is so key. if you are too busy, then you are too busy – i don’t think you should ever feel bad about that! Great tips! I’ve had to take a couple days break from blogging at times to prevent burnout. Sometimes I think if I am only writing for the sake of writing, then it won’t be good content. I always want to post quality rather than quantity. I also step away from reading other peoples blogs. Sometimes my burnout comes from feeling overwhelmed by everyone else and thinking I should be doing more. quality of quantity for sure. and i love that sometimes you take a break from reading blogs. sometimes you just need a break! I always take a day off if I am feeling burnt out or just too tired to think of a post. I never feel bad because life happens! Courtney @ Running For Cupcakes recently posted…The ABC’s of Me! Sleep always helps everything! I think that’s a sign I chronically don’t get enough of it! oh girl, you and me both! it does take a LONG time to comment and respond on others blogs. i have to take it in chunks and i’ve for the most part given up responding to comments on my friday five posts because there is way too many. instead, i make sure to visit others blogs. I swear by my editorial calendar. It lets me see several months at a glance and I can schedule in holiday and sponsor posts where they fit best. For me, the biggest cause of blogger burnout is feeling like I ‘have to’ read everybody else’s blogs (and comment and Tweet and share them). I’ve given up on the ‘have to’ mentality and now embrace ‘what you can, when you can’. It’s made my life so much easier! yes, it starts to take a lot of time to read everything and comment on everything! Great tips! This is super relevant as I’ve recently felt the burnout for one of my blogs. So much content to post, so little time. It can get overwhelming. Yes! It’s fine to take a break or miss a day — I bet you’ll come back feeling fresh! I love coschedule, it has definitely helped me. But sometimes it’s hard to come up with unique posts that everyone else is posting about, it can definitely be a challenge! Yeah, sometimes people have similar ideas but you are the only one with your perspective! Great post! Most of the time I am a scheduler, and that has been the best thing for me. But I am like you, if life gets busy and I don’t have a post scheduled I don’t worry about it, skip a day. When I am on vacation I don’t even schedule posts, I have taken a week off before, just to not have to worry about responding to comments when I am out of town. I also totally agree, blogging should be fun and if we keep it that way, it just becomes such a great stress reliever and fun part of our lives! after blogging regularly for about 3 years, I have definitely found that my blogging motivation will ebb and flow over time (much like anything in life). When I am feeling in a blogging rut, I just do what I can and my motivation usually returns stronger than ever. 🙂 great tips! That’s my strategy as well! Normally I really love blogging and do it Sun, Tues, Weds, & Thurs, but I avoid burnout by giving myself a day off if I just don’t fell like writing. I find I am ready to go again by the next day by not forcing myself to write when I wasn’t in the mood. That’s a great strategy. I’ve thought about moving to blogging on Sunday because I know it’s a big blogging day. Great post & comments! For me, reading & commenting on my favorite blogs takes a bit of a precedence on my own posts. If I don’t have time for both, I’d rather read other blogs than do my own post–especially now when I don’t want to miss any of the race recaps, ha ha! I think I feel less out of the loop that way, and I’m okay with skipping a day of my own posts. Always okay to miss a day in my book! Thanks for stopping by! And yes, getting back to the reasons that we started blogging is so good! I’ve been experiencing burn out lately. D really like to snap out of it but working 60 hours a week is tough, eeek! These are great tips and I’m going to work on them this week. I’m stopping by from SITS & I’m a new follower.